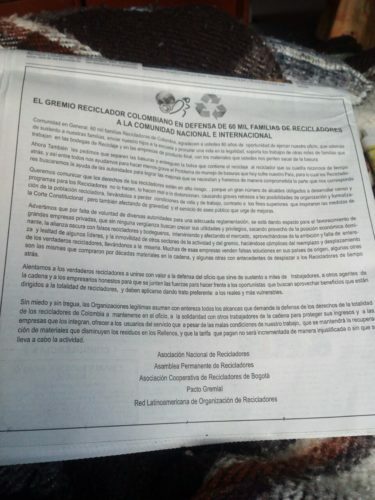 On August 27, 2017, different Colombian associations and waste picker groups – on behalf of the Colombian waste picker movement – published their stance in support of 60,000 waste picker families in the newspaper, El Tiempo Nacional. The rights of waste pickers are in danger due to the negligence of a great number of mayors who, though they are obliged to conduct censuses and develop programmes for waste pickers, don’t develop these programmes, do it badly or distort them. This creates major delays in being able to organize and formalize the waste picker population and leads to a deterioration of their living and working conditions, contrary to the goals which inspired the Constitutional Court’s orders. It also has adverse impacts on public sanitation services which urgently needs improvement. Furthermore, certain authorities’ unwillingness to introduce adequate regulations favours big private companies, who are taking advantage of their dominant economic position. Read the full press release, (in Spanish).